First international documentary project by IDF reserve soldier members of My Truth organization. The My Truth organization, established after Operation Protective Edge that includes hundreds of reserve soldiers, aims to tell the world the true story of what is happening in Judea, Samaria, and Gaza. 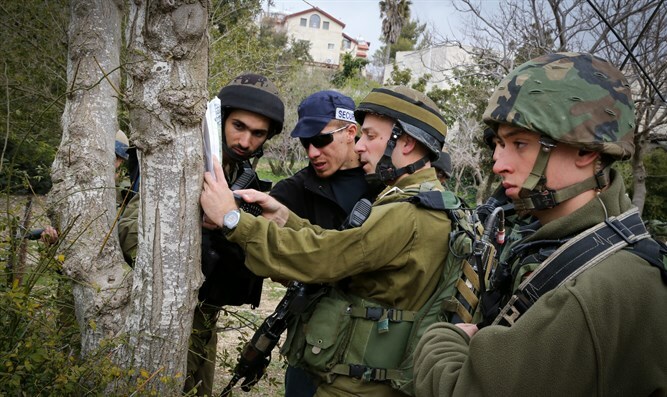 Since its establishment, the organization has brought the voice of reserve soldiers to Israeli citizens, international bodies, and to foreign media to present the real complexity and conflicts soldiers experience in the field. Following the riots near the Gaza fence and the use of human shields by the terrorist organizations, My Truth decided to move from defense to offense. "Human Shield is a project that unveils the abuse of the local Palestinian civilian population by the Palestinian terrorist organizations," the organization's website, mytruth.org.il says. "The testimonies in this project bring the story of former combat soldiers and senior members of the Department of Defense who have encountered in their service in blatant human rights and international law violations by the Palestinian terrorism, against Palestinian civilians, mostly children. The documented cases include many elements that reveal the cynical use of the civilian population by the Palestinian side. Although this use is considered a flagrant violation of international law and human rights." In recent months the organization documented dozens of testimonies from reservists describing human rights violations and use of human shields by terrorist organizations to carry out attacks. The testimonies, most of which are unclassified, were accompanied by close legal counsel, while taking into consideration military censor considerations. As part of the project, a complaint to the International Court of Justice in the Hague is expected to be filed in the coming weeks, including testimonies of soldiers against Hamas and the Palestinian Authority for systematically violating human rights while harming innocent civilians - Israelis and Palestinians alike. The complaint will be submitted in cooperation with lawyers from international legal organizations - the International Legal Forum and the Jerusalem Institute of Justice. A special documentary has recently been published in English and Hebrew including soldiers' testimonies, and is expected to be a central part of the diplomatic and public relations struggle the organization will lead around the world. At the same time, a special site will be launched in two languages ​​where each surfer can be exposed to the true story of the complex reality on the ground. The incidents presented in the documentary represent a broad pattern of using civilian and humanitarian space for terrorist purposes. Testimonies include cases where ambulances were used to transport weapons and terrorists, rockets launched from kindergartens, firing from schools and mosques, planning attacks on clear civilian areas and Israeli settlements, using women and children as human shields, violating humanitarian cease-fires, and many other testimonies describing firsthand the use of the civilian population by Hamas and the Palestinian Authority. "The events of recent months in Gaza have led us to change our pattern of action," said My Truth Director Avihai Shorashan. "The increasing use by terrorist organizations of the civilian population and children in particular has almost completely disappeared from Israeli media coverage, and is absent from the discourse in other countries around the world. Anyone who reads the testimonies in this report will understand how the double-standard morality cries out to heaven. "Not only does the international community not condemn the Palestinian organizations, the repeated violations of human rights, and the exploitation of children and the civilian population, but most of those who are attacked and displayed in a negative light are IDF soldiers who defend the citizens of Israel. The time has come for the international community to act out of real moral power and not out of political considerations and interests," Shorashan added. "The purpose of the testimonies is not only to shock the listener's sense of morality, but to present a flagrant violation of international law," International Legal Forum Director Yifah Segal said in a statement. "These are war crimes and crimes against humanity at the most serious levels. This legal message must be heard before the Court in The Hague. To provide them with the Israeli side, the complex and complete reality, and to give them a sense of identification and perspective that they didn't have the opportunity to get in the past." Jerusalem Institute of Justice Public Diplomacy Department Director Attorney Uri Morad said that "beyond the perception of the negative and erroneous reality that is being accepted in the world in the Israeli context, the legal arena is the tool through which sanctions can be imposed against Israel, whether in parliaments around the world, or in courts or international bodies, such as the ICC. And so the terrorist organizations evade accountability for their own crimes. The testimonies project reflects the power of civil society organizations in this struggle, and the power of such cooperation as a significant force multiplier."